Hanover Architectural Products - Shaffer Block & Concrete Products, Inc.
Shaffer Block is a dealer for concrete paver brick manufactured by Hanover Architectural Products. Hanover has specialized in the production of high quality concrete paving products and concrete wallstone products for over thirty-eight years. Hanover's extensive line of concrete paving products truly completes your home and landscaping. They offer a line of small hand held brick to larger scaled paver slabs. Hanover's products are available in a wide selection of sizes, styles and colors. No other company can offer the superior quality and complete selection of pavers, bricks and walls that Hanover can. Their reputation stands solid with product performance and service to their customers. 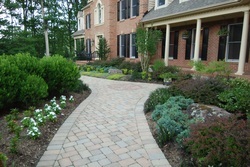 For more information about Hanover Architectural Products please visit their website: www.hanoverpavers.com .